The iRonsnow IS-088 is a fully capable weather emergency radio that does what it is supposed to do and even more. It has an impressive number of features that have somehow been packed in a small-sized device. It can be used as a charger for smartphones and gives a helping hand to people who are living in area prone to natural disasters. If you haven’t made up your mind on a model, this one may be worth considering. Most of the reviews we have analyzed mention that this device is not capable of fully charging a smartphone. 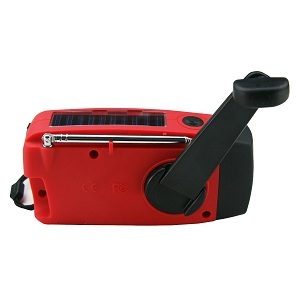 However, if a buyer uses the hand crank more often, it might be able to provide energy for a 10-minute call. The consumers who reported this minor issue state that they understand that the radio was not designed to be an external charger for their phones. It appears that this detail is no inconvenience for most of the people who bought the iRonsnow IS-088. The neat thing about the iRonsnow IS-088 is that it can be charged via a variety of power sources. 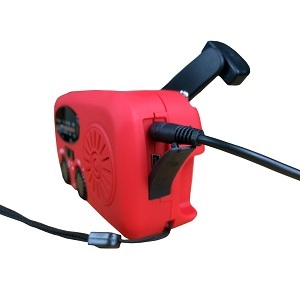 For example, one may use the hand crank to wind up the internal alternator. At the same time, solar energy is one of the most useful and free power sources that exist on the planet, and the fact that the iRonsnow IS-088 can be charged using a solar panel is a net advantage. It goes without saying that the model can be powered up via DC recharge and by connecting the unit to a computer. In fact, this device has a mini USB port on account of which the weather radio can be charged. The iRonsnow IS-088 can be used both as a regular AM/FM radio and as an emergency radio, considering that it is more than capable to broadcast the typical frequencies and the seven NOAA weather channels. Aside from being capable of a very good performance, the model is remarkably convenient, as it features a small size and is relatively lightweight. The fact that it’s so portable means that it can be utilized by the people who regularly work outside. One minute of hand cranking can allow users to place a 5-minute cell phone call, use the unit for 30 minutes as a torch light, and listen to the radio for 5 minutes. Close to 80% of the individuals who have purchased this variety claim that it is worth the price. While some online marketplaces may try to sell it for around one hundred dollars, Amazon customers can get this device at a much fairer price. Considering the reviews we have analyzed, the iRonsnow IS-088 seems to offer good value for the cost. Ever since it has been released, it has helped people cope with difficult situations. Some consumers state that they like the fact that the radio seems to be water resistant, which means that it can be used as a flashlight when it is raining outside.